As you all well know by now, I absolutely love French Pharmacy skincare. Every single product I have tried from Bioderma, Nuxe and Uriage has been amazing and these are certainly no exceptions. I recently attended a brand breakfast where I and a few other bloggers learned all about the science behind these new releases and I have to say, I am impressed. So without further ado, lets get to it! At 23, I'm not looking for intense, chemical filled anti-aging products but I still want to actively prevent the deterioration of my skin and boost its hydration and luminosity. That is where this serum comes in. To briefly summarise the science behind it, it is designed to energise the your skin cells which become sluggish over time, to repair the mitochondrial DNA (which is essentially the battery of your skin cells) which carries out the natural regenerative and detoxing processes of your skin. It doesn't use chemicals to boost collagen or anything like that, but rather uses natural flower extracts to boost the natural detoxing and repairing capacity of your skin and it's absorption of moisturisers. It has also been been clinical tested to show a 43% improvement in these areas. They even go so far as to claim that it will make you look as though you slept an extra two hours and who doesn't want that! I don't know if it is really a substitute for two hours sleep but I did notice a significant improvement in the texture, moisture levels and overall appearance of my skin over four weeks of use. The formula is a very light and quickly absorbed lotion with a pleasantly subtle fragrance. I applied it every single night after cleansing and toning and followed up with my favourite Nuxe Creme Prodigieuse Eye Cream and Night Cream, but you can use whatever skincare regime you like. It is designed as a booster serum to fold into your existing nightly routine. It is also worth noting that it is quite an cost effective serum at just $65 for a huge 50mL tube. Incrementally, it also has the coolest and most travel friendly twist shut pump top packaging I have seen in my life. I will definitely be repurchasing it and using it every single night because it is one of those few skincare products that makes big claims and actually lives up to them as well as really fulfilling the things I need from my skincare products. Nuxe also released a Nuxellence Eclat Anti-Aging Day Serum which has an added illuminating effect though it doesn't have the ingredients that promote cell detoxification. I do really want to try the day serum as well but if you can only afford to splurge on one, definitely get the Detox night serum. This one doesn't seem to be up on Adore Beauty or Priceline yet but it will be coming really soon. As you all probably know, I am an absolute devotee to the Bioderma Sensibio Micellar and I honestly couldn't even imagine never having a bottle at the ready. That said though, it is always nice to try new things. It seems that every brand has a Micellar Water these days (don't be fooled people! Bioderma is the original and the best) but Uriage is the first to combine the soothing and moisturising properties of thermal water with cleansing micelles. If you didn't know already, micelles are lipid molecules that bind any oil based makeup like a magnet for gentle and efficient makeup removal. Now I will say that this isn't quite as good at removing every trace of my heavier dark eye makeup as the Bioderma, but it still does a great job. It is also slightly cheaper and has noticeable soothing properties that I really like. It also has a subtle and delicate fragrance and is infused with natural ingredients like cranberry extract, lotus, nashi pear, white tea, rose and lily of the valley while still being completely non-irritating to the skin and eyes. If you have very sensitive skin I would probably still recommend you stick with the fragrance free Bioderma, but if you are looking for a slightly luxe but still very affordable alternative that offers some soothing hydration, definitely check this one out. Okay, first let's just pause to appreciate the great price point of these makeup wipes. At the brand breakfast, we were all asked to guess the retail price of these and most of us put them in the $15-$20 range. They are incredible value for such a high quality pharmacy brand and Uriage often goes on sale for 25% off at Priceline which makes them even more affordable. I love makeup wipes for easy and convenient makeup removal, as a sort of first cleanse before I do my proper cleansing wash. While they get the bulk of the makeup off, I still think it is really important to remove your makeup and then cleanse your skin as a totally separate step. Trust me when I say this really reduces the congestion in your skin and risk of breakouts. To put it simply though, I absolutely love these wipes and they are some of the best I have every used. They remove all visible traces of my makeup while leaving my skin fresh and soothed thanks to the thermal water. I will absolutely be repurchasing these because I have genuinely enjoyed using them every day. Just as a note, like with any makeup wipes, please make sure you properly seal the packet after you use them so they don't dry out. Also only buy makeup wipes if you are going to use them everyday because they are less far less hygienic than using cleansing washes or liquid makeup removers but if you use the whole pack within a month of opening and have clean hands when you are grabbing one out you will be fine. So there you have my review of the latest offering is French Pharmacy Skincare. 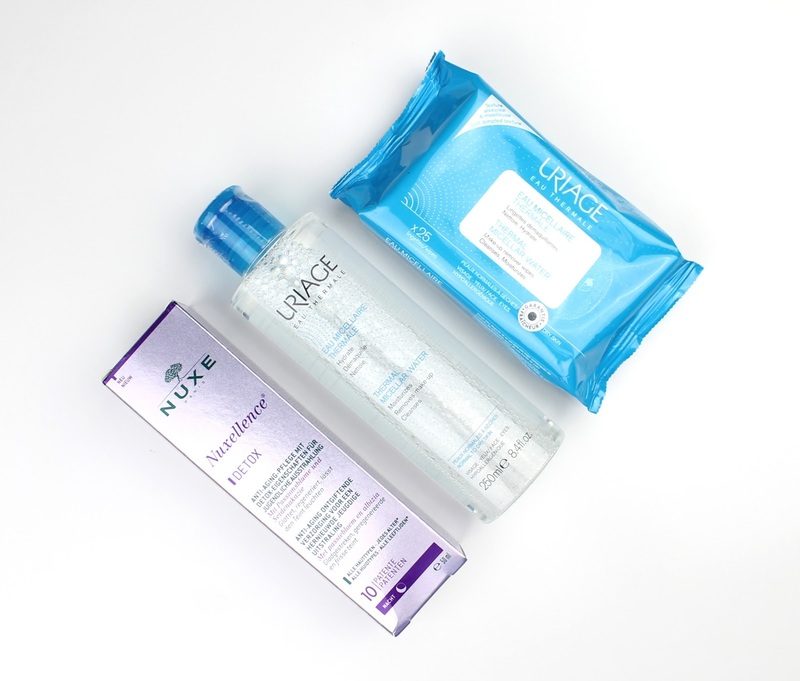 I absolutely LOVE the Nuxellence Detox Serum and Uriage Thermal Micellar Water wipes and will definitely be repurchasing without a second thought. That is also really saying something as well because as a blogger I usually have a backlog of skincare to try so a product has to be really good to justify me buying it again instead of just using stuff I get for free. While I did like the Uriage Thermal Micellar Water, it doesn't quite beat my holy grail Bioderma Sensiobio. All in all though, you simply could not go wrong buying these products, or anything from Bioderma, Nuxe or Uriage really. Will you be picking these up from Adore Beauty or Priceline to try? Let me know in the comments below. 2 comments on "New from Nuxe and Uriage"